Rep. Mike Quigley (D-IL) has introduced the Communications Over Various Feeds Electronically for Engagement Act or "COVFEFE" Act, which would make the president's tweets and other social media postings subject to the Presidential Records Act. The bill's acronym is a reference to President Donald Trump's late-night Twitter typo that quickly became a meme. The original "covfefe" tweet was subsequently deleted. Under the new act, it would possibly be illegal for President Trump to delete tweets. Quigley said that Trump's tweets are "powerful," and there needs to be a way to hold the president "accountable for every post." "President Trump’s frequent, unfiltered use of his personal Twitter account as a means of official communication is unprecedented. If the President is going to take to social media to make sudden public policy proclamations, we must ensure that these statements are documented and preserved for future reference. Tweets are powerful, and the President must be held accountable for every post," said Quigley in a statement. 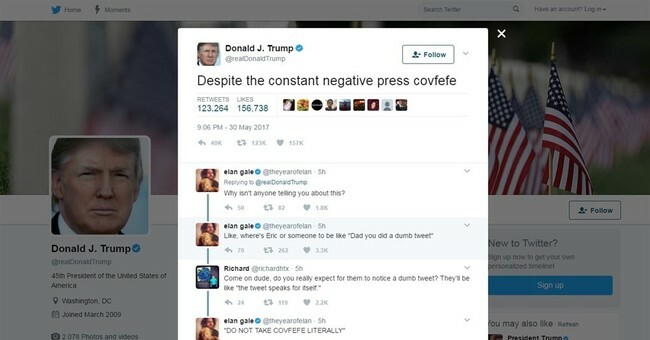 Most people took the "covfefe" tweet to be a typo, although press secretary Sean Spicer told the media that the term was used intentionally. "The president and a small group of people know exactly what he meant," he said. Quigley has also submitted legislation with the acronym "MAR-A-LAGO." This "covfefe" thing is absolutely absurd. It's clearly a typo. They happen to the best of us (including yours truly). There's no need to create a new law about the whole shebang. "Covfefe" has officially jumped the shark.